The graffiti removal standard for the City of Abbotsford have become a large part of Gorilla Property Services’ portfolio. Abbotsford is always growing, welcoming tons of new residents and businesses annually. This makes Abbotsford Graffiti Removal one of our busier services. Due to large residential and commercial growth, we had to divide our Abbotsford Graffiti Removal team into two divisions. Having two teams benefits both our staff and our community. Our office still receives a relatively equal number of requests from both “Abby East” and “Abby West”. Our largest volume of call outs is for residential graffiti removal. Keeping a close eye on the Abbotsford area certainly makes for a full schedule. However, our fully trained and certified Gorillas can handle it! Immediate removal and regular monitoring helps to beat graffiti in both regions. Let Gorilla Property Services help you fight the battle. Residents can’t prevent street artists from leaving their mark. Call our Gorillas at the first sign of graffiti. 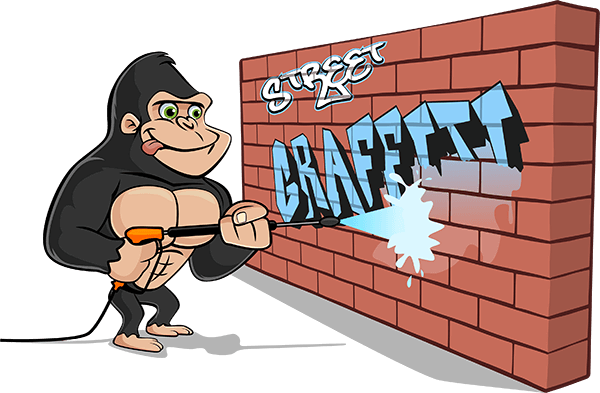 When you decide to contact Gorilla Property Services, we dispatch our Abbotsford Graffiti Removal teams at the earliest opportunity. We want to ensure the area in question does not become a regular haunt for local taggers. Dealing with the issue quickly and efficiently shows them you are serious! We regularly monitor Abbotsford’s downtown to ensure that businesses are kept graffiti free. At the end of the day, after everyone has closed up and gone home, these areas are pretty quiet. Normally, this would make life a little easier for taggers. Not with our Gorillas on patrol!